A Black and Tan beer is equal parts of stout and pale ale, with the stout floated on top. 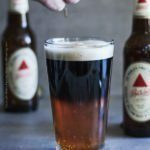 By definition Black and Tan is a layered beer cocktail. Possibly the most famous layered drink in the world. The original tan on the bottom is Bass ale. Guinness Draught Stout is the most commonly used stout in Black and Tan. Interestingly Harp lager is a popular tan alternative to the classic Bass pale ale. for a time Harp used to be owned and brewed by Guinness (see historical notes below). On the flip side Harp is a pale lager, not a pale ale and is harder to find (and less popular) nowadays (again see historical notes below). 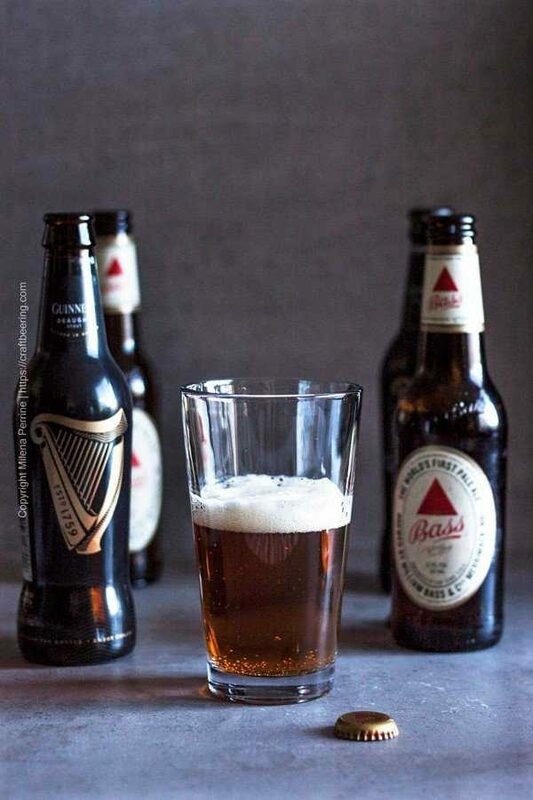 To stay historically correct, in this post we are using Bass pale ale – a full flavored English style pale ale and once the world’s highest selling pale ale, and smooth and creamy Guinness Draught stout with its landmark balance of bitter and sweet and roasted coffee and malty notes. 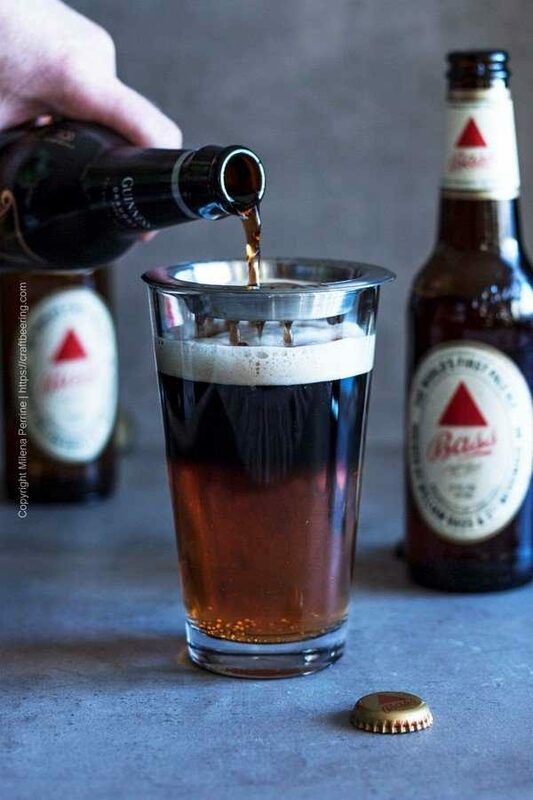 How to Pour a Black and Tan? The best suited glassware for a Black and Tan beer is shaker pint, English tulip pint (or branded Guinness pint glass) or a nonic pint. To pour a Black and Tan you always start with the lighter colored pale ale. Pour holding the glass at a slight angle (as shown above) and fill it half way. 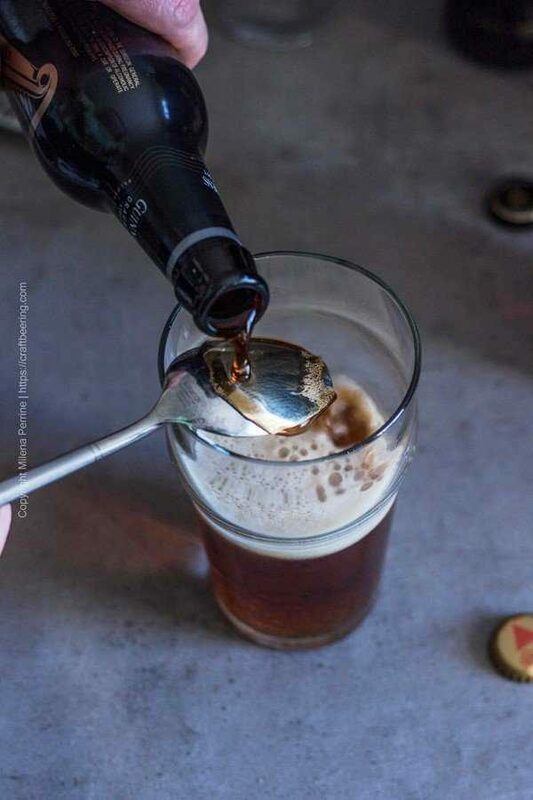 The most common method to add the stout is to use the back of a spoon to gently pour it over the pale ale. (Scroll down for a second, even easier method). While pouring aim for a continuous, measured and steady flow of stout. Center the flow over the most convex part of the spoon and tilt the spoon towards the center of the glass to avoid stout spilling over the spoon handle. Guinness actually makes Black and Tan spoons designed for the express purpose of pouring the layered drink. They attach to the rim of the glass. 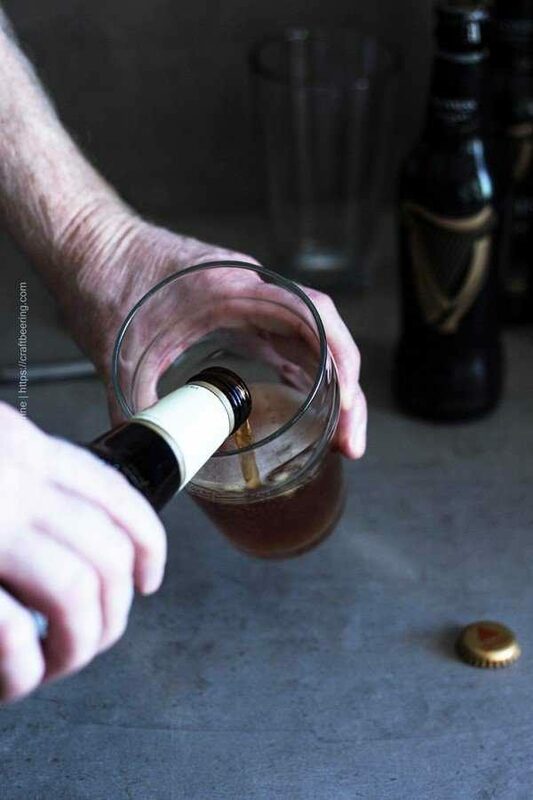 When you are finished, the Guinness will float in a separate layer over the pale ale. Why Does the Stout Float on Top? Layering can be accomplished because of the different densities of liquids. Guinness is a lighter beer (i.e has lower density, many stouts do, unless imperial) and if poured slowly and carefully over the more dense Bass pale ale will float. This is because of the lower specific gravity of stout as a style. Specific gravity is a notion that describes the density of a certain beer relative to the density of water. Beers with higher specific gravity are heavier while beers with lower specific gravity are lighter. To break it down further – gravity itself means the total amount of dissolved solids in water, which in the case of beer are sugars from the malted grain. Those sugars then get converted to alcohol and the lower the alcohol content, the lighter (and less dense) the beer. The typical grain bill for stouts like Guinness is such that it results in less sugars and lighter beer despite the very flavorful experience. An even easier way to achieve the layered Black and Tan look is to use a layering tool. Start the same way, with a pint glass half filled with pale ale. 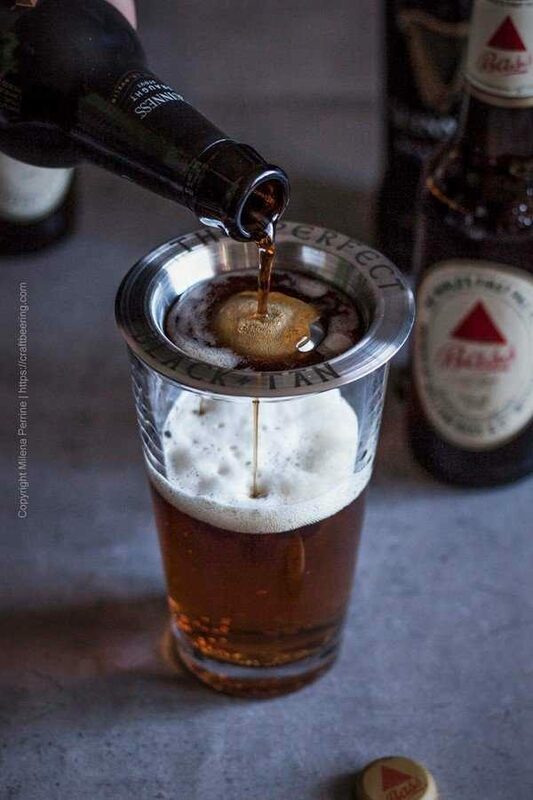 Place the layering tool on top and begin to slowly add a controlled, steady flow of Guinness. The stout will trickle down through a series of small holes around the perimeter of the tool. When the glass is full simply lift the tool to remove it. I have better results with the layering tool than a spoon because my hand never seems to be steady enough and I tend to move the spoon around, which results in spilled stout and/or poor layering. I have not tried the Guinness pouring spoon. With the layering tool however all I have to do is focus on the steady, gentle stream of Guinness, not the stability of my hand. So either Chris pours us Black and Tan beers using a regular spoon (his preferred way) or I use the layering tool. In the end, it tastes exactly the same:). Just a few curious details here. 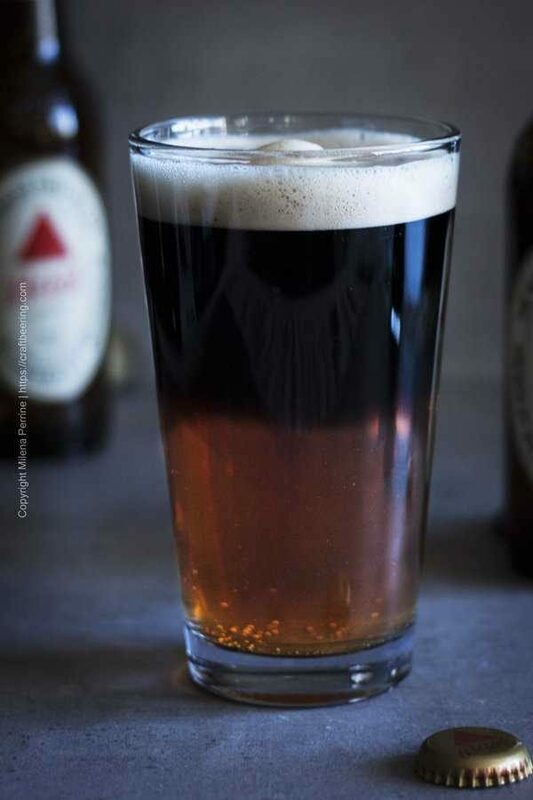 The name ‘Black and Tan’ has its origins in Britain where blending two or more beers was a common practice at least since the seventeenth century. 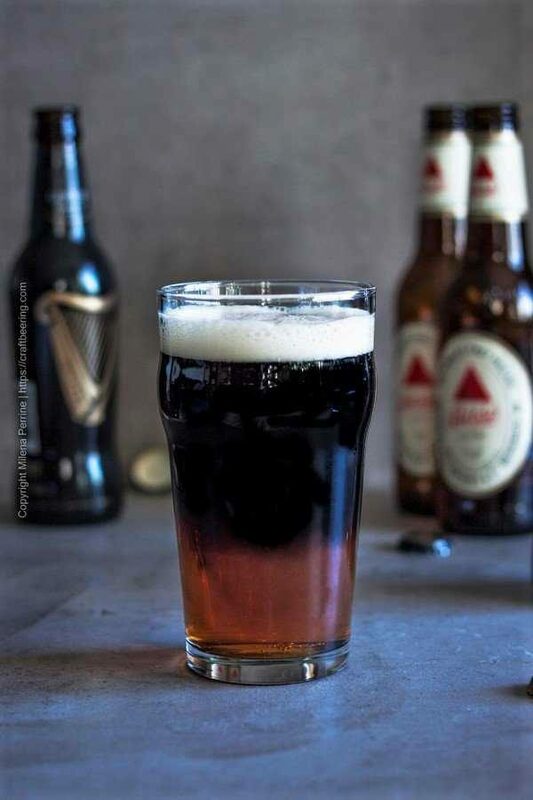 Despite the Guinness connection in Ireland Black and Tan is in fact not a popular phrase. It is associated with the colors of the uniforms of the Royal Irish Constabulary Special Reserve (mostly British soldiers) stationed on the island to suppress Irish independence efforts in the 1920s. Many travel guides will advise you not to order a Black and Tan at Irish bars, thinking that it must be a popular request. Instead, order a ‘half and half’. Harp lager was for a period owned by the Guinness brand and even though not an ale it was quite popular as the tan component of Black and Tan beer. In 2005 Harp lager was separated from the Guinness brand and today it is brewed in one brewery in Ireland and one brewery in England, Great Britain. All Harp lager sold in the North American market is brewed under contract by Moosehead Breweries Limited – Canada’s oldest independent brewery, located in Saint John, New Brunswick. Bass was one of the world’s first pale ales, brewed by William Bass at the Bass Brewery he founded in 1777. It was by far the best selling pale ale in the British Empire. 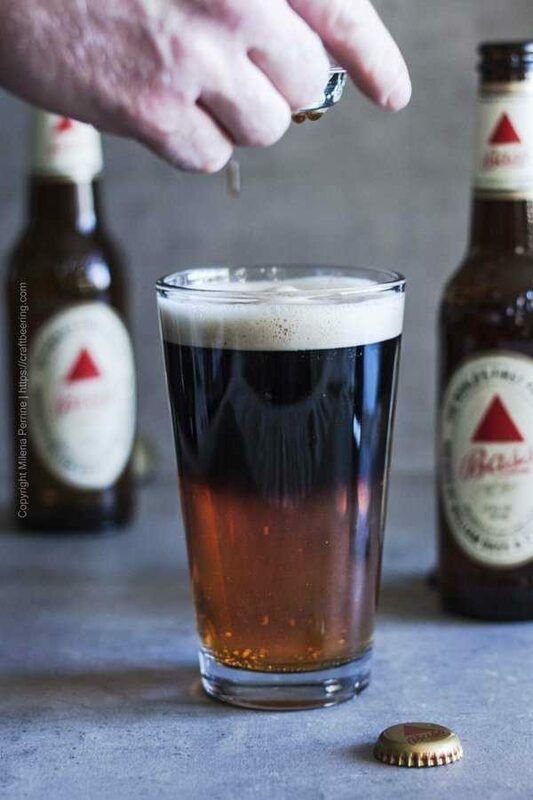 Two ways to pour a perfect Black and Tan beer. A pale ale is the tan on the bottom and a stout is floated on top. Pour the pale ale in a pint glass. 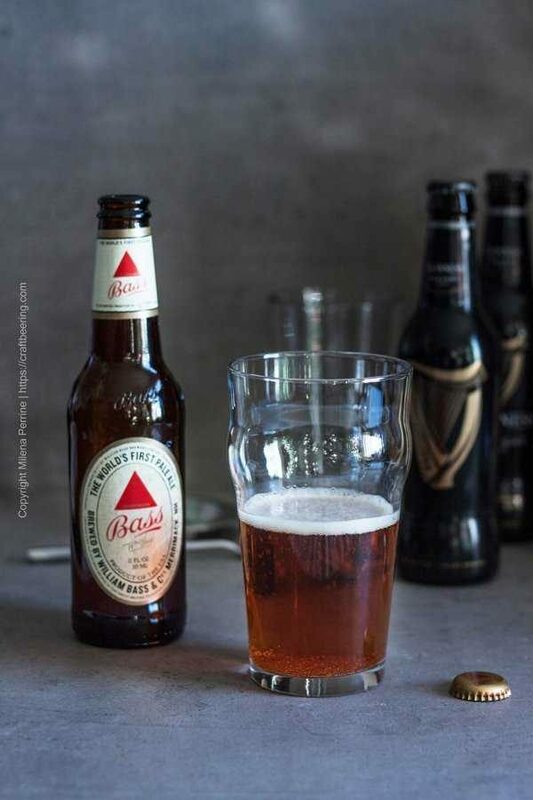 Using the back of a spoon or a layering tool gently pour the stout over the pale ale to achieve a layered look. Enjoy! 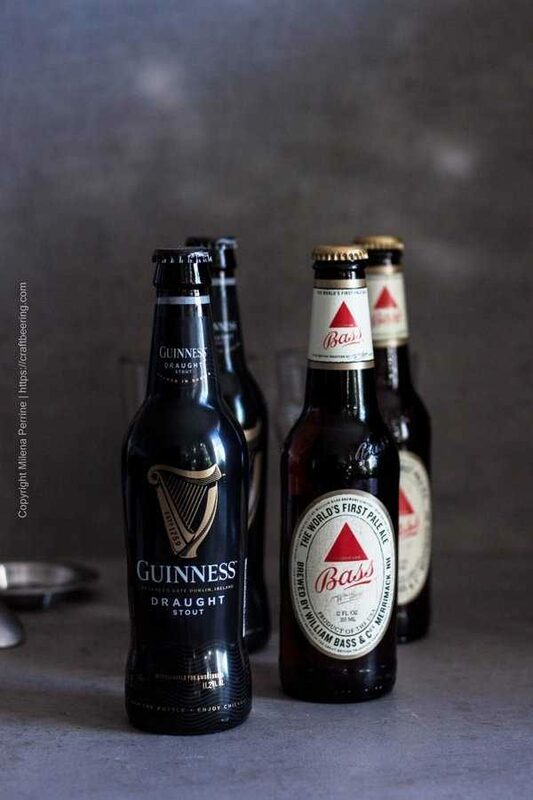 The classic combination is Guinness Draught Stout and Bass pale ale. Use any similar stout or pale ale. Imperial stout will not float due to its higher specific gravity. There is also a special pouring spoon made by Guinness for the express purpose of layering the stout.